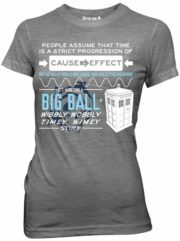 This is a heather gray baby doll/Juniors Women’s style t-shirt bearing the explanatin and quote of how the Tardis works, from the long running British sci-fi TV series Doctor Who. This is a new, never worn t-shirt. This is a 1.25″ wide nylon web belt featuring the Tardis in space exploding beside the phrase “Wibbly Wobbly Timey Wimey” from the long running British sci-fi TV series Doctor Who. It has a military style bright chrome buckle measuring 2 1/8″ x 1 1/8″ with the phrase repeating for the entire length of the belt. 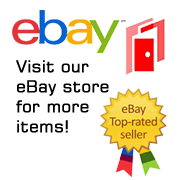 The belt measures 48″ long and can be cut to fit the size you desire. This is a 2.75″ wide cinch belt featuring the image of the Tardis in space beside the words “Wibbly Wobbly Timey Wimey” from the long running British sci-fi TV series Doctor Who. Made from a heavy duty stretchable nylon, it has a sliding buckle with the image repeating for the entire length of the belt. It is available in two sizes: small/medium which is 28″ long unstretched and medium/large which is 35″ unstretched. 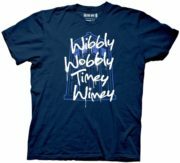 This is a navy blue t-shirt bearing the words of how the Tardis works, Wibbly Wobbly Timey Wimey over a background image of the Tardis, from the long running British sci-fi TV series Doctor Who. This is a new, never worn t-shirt. 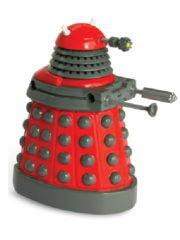 Produced in 2011 by a British company, this is a 3 1/2″ high reproduction of the Doctor’s worst enemy a Dalek. Wind up the Dalek to activate it and watch it patrol around menacingly, moving its head from left to right as it seeks out life forms to exterminate. 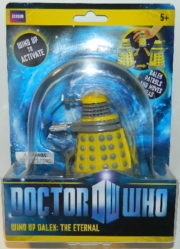 Produced in 2011 by a British company, this is a 3 1/2″ high reproduction of the Doctor’s worst enemy a Dalek. Wind up the Dalek to activate it and watch it patrol around menacingly. Produced in 2011 by a British company, this is a a pair of 3 1/2″ high reproductions of the Doctor’s worst enemy, Daleks, featuring and red and the yellow “The Eternal” version. Wind up the Dalek to activate it and watch it patrol around menacingly, moving its head from left to right as it seeks out life forms to exterminate. 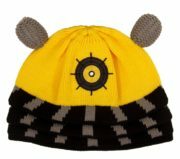 This is a black, grey and yellow beanie hat in the image of a Drone Dalek as seen on the long running British sci-fi TV series Doctor Who. Published in 2014 by Harper Collins this is a large softcover trade book. “I’m the Doctor. I’m a Time Lord. I’m from the planet Gallifrey in the constellation of Kasterborous. And I’m the man who’s going to save your life.” This is the story of an impossible life—of a man who borrowed a spaceship, travelled through time and continually saved the universe—as told by the Doctor’s friends, by his enemies, and by the man himself. Letters, journals, trial records, secret government files and the occasional bit of tabloid journalism reveal the never-before-told story of Gallifrey’s last Time Lord. Published in 2014 by Harper Collins this is a large 288 page hardcover trade book about Doctor Who. 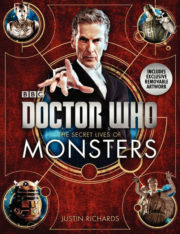 A unique, in-depth look into the hidden lives and mysteries of the monsters from the hit BBC series Doctor Who—a fully illustrated color compendium that reveals proof of the existence of alien life out there and among us, packaged with removable artwork commissioned exclusively for the book. For years, world governments and multinational organizations like the secretive UNIT have suppressed the truth. In this book, leading alientologist Justin Richards finally blows the lid off the biggest conspiracy to radically alter our world since The Scarlioni Incident. Not only is there proof that alien life exists. The aliens are already here. Based on exclusive access to classified UNIT and Torchwood files—shocking information that has been suppressed for centuries—The Secret Lives of Monsters reveals the terrifying truth behind the rumors and legends. 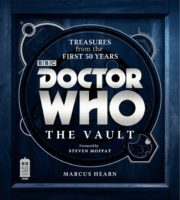 Published in 2013 by Harper Collins this is a large 320 page hardcover trade book about Doctor Who. The full and official story of Doctor Who, from the show’s first pre-production memos in 1963 to behind-the-scenes material from the latest season, including interviews with key cast and crew members as well as scores of prop photos, design sketches, and other collectible memorabilia. 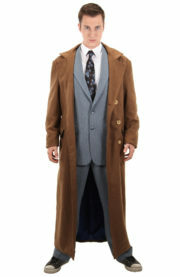 This is a faux-wool polyester blend jacket that is fully lined in blue and features functional side pockets and a special hidden inside pocket for your sonic screwdriver that is a licensed reproduction of the one worn by David Tennant as the tenth Doctor from the long running British sci-fi TV series Doctor Who. This is a new, never worn jacket in size small/medium which fits a mans chest size 36-40. It is still in its original packaging. 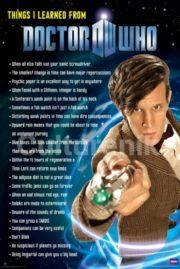 Printed in 2011 by Culturenik, this poster depicts the Doctor as played by Matt Smith with his sonic screwdriver, beside a list of all the things you can learn from the Doctor as seen on the long-running and highly popular British science fiction TV series Doctor Who. 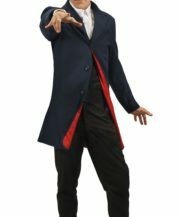 This is a faux-wool polyester blend jacket that is fully lined and features functional side pockets and a special pocket for you sonic screwdriver that is a licensed reproduction of the one worn by Peter Capaldi as the twelfth Doctor from the long running British sci-fi TV series Doctor Who.